So who does the evaluation? As the first to connect with a specific vendor (in the Consideration stage), evaluation often comes from the partner sales teams. In some instances, depending on the size and focus of the solution provider, the solution architect (or practice manager) might start the dialogue with a specific vendor. This is interesting because most vendors expect a prospective solution provider to complete an online partner application to kick off the engagement process. However, if the partner sales representative starts the discussion inside the solution provider and begins talks to evaluate new vendors, these sales folks are not going to take the time to complete a vendor’s partner program application. On the vendor side, the VP of Channels identifies the need to recruit new or different partners but the Channel Development Manager (or Partner Manager) is responsible for evaluating potential partners’ alignment to the target profile. (This could also be the Director of Channel Sales depending on the size of the vendor organization.) This early engagement between the vendor partner manager and the solution provider sales rep will determine if a vendor is included as part of the solution providers’ consideration set. As discussed in our 2018 State of Partnering report, the vendors’ top five recruitment priorities are (in order): systems integrators (regional or global), managed service providers, born-in-the-cloud solution providers, traditional resellers and services partners. 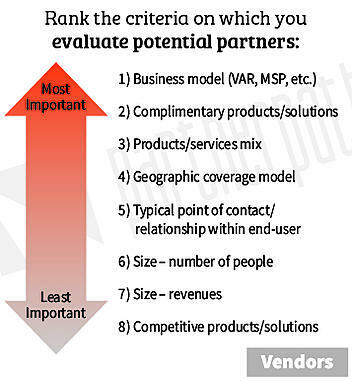 They ranked Business Model as their primary criteria to evaluate partners against these recruitment priorities. 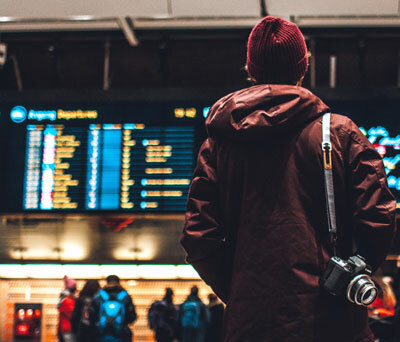 Since the Partner Manager – or what we call the Channel Development Manager – handles the evaluation, he/she needs to align the company growth expectations with recruitment priorities and the value exchange with each type of solution provider. This isn’t always a given. Often vendors don’t take the time to train channel managers on the different partner business models and how their programs bring value to those partner models. Complementary products or solutions is the most important criteria for a vendor to evaluate, considering the importance the partner assigns to compatibility with other solutions in their evaluation of vendors. A solution providers’ mix of product sales and services revenue identifies potential partners with a successful services practice. To be able to fill coverage gaps, vendors also want to know the partners’ geographic coverage. For example, does the partner cover Southern California or a small patch of Northern California? Knowing the partners’ typical point of contact in a customer helps identify if they will be selling to line-of-business decision makers or to IT departments. Both revenue size and company size metrics determine the partner’s capacity for growth with vendor solutions. It isn’t a predictor of success. Bigger isn’t always better. But if the solution provider is a $200m company they have more capacity for growth with a specific technology or product than a partner with only $5m in yearly revenues. Lastly, the metric of competitive products/solutions identifies if the partner is already knowledgeable/successful in a specific technology or market. Quite frankly, it is surprising the vendors didn’t rate this criterion much higher, as it shortens the onboarding time and indicates likely success. Plus, it’s high on the solution provider evaluation criteria. Each of these individual metrics provides relevant data about a partner’s business and potential success within your ecosystem. When compiled together they create a powerhouse evaluation. It’s easiest to collect these metrics in a phone call with the solution provider sales representative, likely the person who reached out for some initial information about your products and pricing. Often these requests come through your website to the inside sales team and should be quickly and efficiently routed to the channel management team to develop and nurture a relationship with the solution provider rep. The solution providers also ranked product functionality and compatibility with existing solutions as very important to their evaluation processes. Solution architects get involved in the evaluation of technologies and vendors during this Consideration stage for this very reason. It is highly unlikely solution providers would expect their sales teams to evaluate the product functionality, which is needed to move into the next stage: Decision. Subscribe to our blog to keep learning about the Partner Journey. Educate and train your Partner Managers to engage with a solution partner sales person and/or solutions architect – the first folks who evaluate the technologies and vendors. Don’t make the solution provider partner submit a formal partnership application on your portal at the consideration stage. Make it easy for them to gather information to bring back to their organization as they move into the Decision stage. Create communications and materials that speak to the evaluation points of: easy access to support, your great pricing, your products’ robust functionality and compatibility with other products/solutions.